A guy took his blonde girlfriend to her first football game. They had great seats right behind their team's bench. After the game, he asked her how she liked the experience. "Oh, I really liked it," she replied, "especially the tight pants and all the big muscles, but I just couldn't understand why they were killing each other over 25 cents. "Dumbfounded, her date asked, "What do you mean? ""Well, they flipped a coin, one team got it, and then for the rest of the game, all they kept screaming was, 'Get the quarterback! Get the quarterback!' I'm like, hello? It's only 25 cents!" 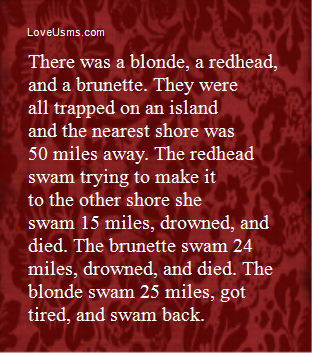 There was a blonde who just got sick and tired of all the blonde jokes. 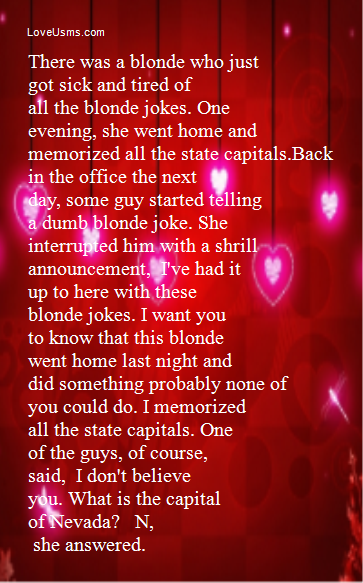 One evening, she went home and memorized all the state capitals.Back in the office the next day, some guy started telling a dumb blonde joke. 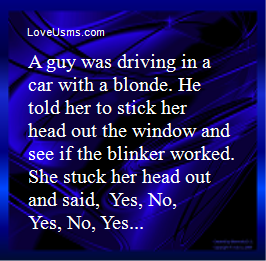 She interrupted him with a shrill announcement, "I've had it up to here with these blonde jokes. I want you to know that this blonde went home last night and did something probably none of you could do. I memorized all the state capitals. "One of the guys, of course, said, "I don't believe you. What is the capital of Nevada?" "N," she answered. A blonde, wanting to earn some money, decided to hire herself out as a handyman-type and started canvassing a wealthy neighborhood. She went to the front door of the first house and asked the owner if he had any jobs for her to do. "Well, you can paint my porch. How much will you charge? "The blonde said, "How about 50 dollars?" The man agreed and told her that the paint and ladders that she might need were in the garage. The man's wife, inside the house, heard the conversation and said to her husband, "Does she realize that the porch goes all the way around the house? "The man replied, "She should. She was standing on the porch. 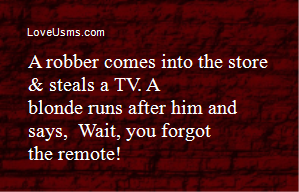 "A short time later, the blonde came to the door to collect her money. "You're finished already?" he asked. 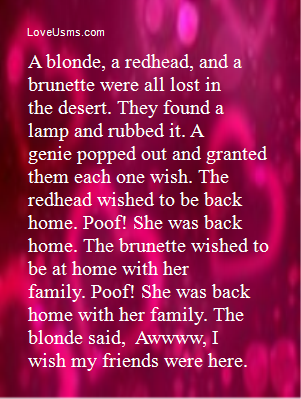 "Yes," the blonde answered, "and I had paint left over, so I gave it two coats. "Impressed, the man reached in his pocket for the $50. 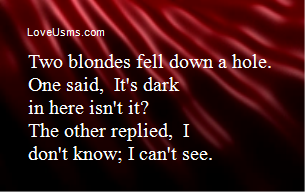 "And by the way," the blonde added, "that's not a Porch, it's a Ferrari."